Happy birthday Jane Breskin Zalben (Paths to Peace: People Who Changed the World; Four Seasons), Tim Jacobus (It Came from New Jersey! : My Life As an Artist, Goosebumps series cover artist). It’s the birth date of Charlotte Brontë (1816-1855) Jane Eyre. John Muir (1838-1914) was born on this day. Read Squirrel and John Muir by Emily Arnold McCully; John Muir: America’s First Environmentalist by Kathryn Lasky, illustrated by Stan Fellows; and John Muir: America’s Naturalist by Thomas Locker. According to legend, twins Romulus and Remus found Rome in 753 BC. Read Romulus and Remus by Anne Rockwell and Roman Myths by Geraldine McCaughrean, illustrated by Emma Chichester Clark. Today we celebrate Kindergarten Day, observed on the birth of Friedrich Froebel, who founded the first kindergarten in Blankenburg, Germany, in 1837. Froebel believed that play, toys, and music formed the building blocks of children’s education. 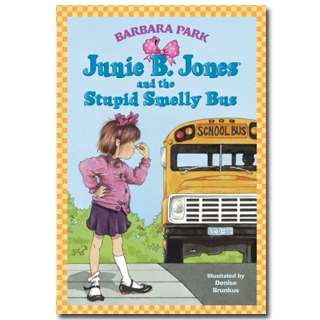 Certainly the most famous kindergartner in the canon of children’s books, Junie B. Jones, does not initially believe that going to school is a good idea, particularly riding on that stupid, smelly bus. In fact, she will do anything, even hide in the supply closet, to avoid it. Welcome to the very real and very funny world of Junie B. Jones, created by comic genius Barbara Park. Reading expert Jim Trelease has always claimed that Junie’s series, which started to appear in 1992, are the most stolen books in the United States. One teacher in Washington, D.C., records having 800 Junie B. Jones books swiped from her classroom in one year. She happily replenishes them—because after all a stolen book is one that a child can’t live without. The saga begins in Junie B. Jones and the Stupid Smelly Bus. Junie starts Kindergarten in her own manner—driving the teacher, principal, and her mother a bit crazy on her first day. She says what she thinks; she talks when she wants. She acts up, and she murders the English language. 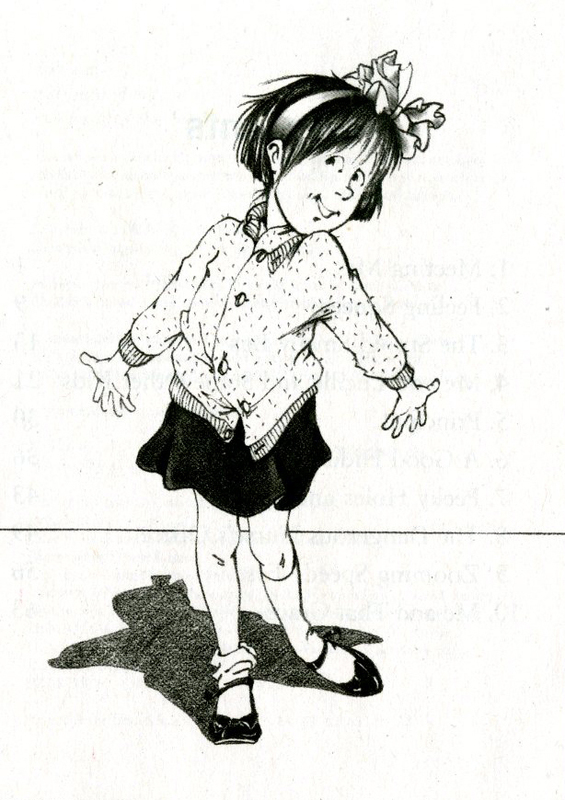 Most readers in the six- to eight-year-old age range identify with Junie B. immediately. I’ve known children who read only Junie B. Jones books while they are in kindergarten—one after another. Not only do adults misunderstand Junie B., she frequently misinterprets them. In the second book, Junie B. Jones and a Little Monkey Business, Junie hears her grandmother describe her newborn baby brother as a cute little monkey—and Junie takes Grandma literally. Now Junie B. believes she will have a pet monkey to play with. With twenty-seven volumes that take Junie B. from kindergarten to first grade—and with around twenty-five million copies in print—this series provides the perfect way to keep kindergarteners entertained as the year progresses. With her energy, screwball logic, and true-to-life behavior, Junie B. Jones has won over one reader after another for eighteen years. Although adults don’t always comprehend the behavior of Junie B., her readers know—beyond a shadow of a doubt—that Barbara Sue Park completely understands them. The bus wasn’t like my daddy’s car at all. It was very big inside. And the seats didn’t have any cloth on them. The little curly girl was sitting near the front. And so I tapped on her. Then she put her little white purse on the place where I was going to sit. And so I made a face at her. Also recommended: Junie B. Jones and Her Big Fat Mouth by Barbara Park, illustrated by Denise Brunkus.•Junie B. Jones and Some Sneaky Peeky Spying by Barbara Park, illustrated by Denise Brunkus. Originally posted April 21, 2011. Updated for . I never would have guessed that Junie books are some of the most stolen! I remember reading Junie B Jones in first grade along with the Magic Tree House books. Junie B’s antics kept me laughing and the simple, fun stories encouraged my love of reading from a young age. I am a first grade teacher who uses Junie B. as a read aloud at the end of each day. The kids LOVE hearing her escapades – and can relate to them ! The humor in the stories is fabulous, and some adult humor is hidden in there too ! We even use Junie B. phrases around the classroom – “Let’s line up speedy quick!” or “Don’t be a nutball !”. Thank you for showcasing these wonderful books ! What? 1992?? Feels like yesterday. I laughed myself silly over this book when it first appeared. I just love the quote ” A stolen book is one a child can’t live without” genius! We listened to our first Junie B. while driving our granddaughter to the beach. We arrived and had about 15 minutes to go to the end—so we all sat in the car and listened. Junie B. is so real and so funny. Three cheers for Barbara Park. I am so happy to see the Junie B. Jones books celebrated by you, Anita, and in the comments because I encounter many parents who do not like Junie B. They do not like her personality, her attitude or they way she talks and they refuse to listen to reason! I’ve always found the stories fun and funny and as a public librarian enjoy seeing the enthusiasm of her fans! I wish I could say something intelligent about how my students love Junie B, but I must confess that I’ve only ever used Junie B. for me. I laugh out loud, I read sections aloud to friends over the phone, and when I discovered the series, I gobbled it up in about three days. Good old local library! I love Junie B’s voice and her response to the world around her. I wasn’t a big reader when I was little: I hated reading, actually. But I do remember loving the Junie B. Jones books, because I could identify with her and relate to her opinions. I love Junie B. Jones! I love seeing kids’ reactions as they read Junie B. They always seem to look up in the middle of it with a face that clearly says, “Books can do this?” before burying their heads back into the book. Junie B. Jones helped me become a better teacher. I began to realize that my students were not purposely trying to break and bend rules – rather – in their minds – their reality was the only one!! I am so thankful for her authentic child-like mind. She taught me how to understand my student’s personal worlds. Thought you might like to know Junie B is popular in Australia too – well in my library! I indulged my own passion for Junie and bought the whole series! Momo: Thanks for your post — I am always happy having a view from Australia!